Will you soon be taking “The ATL” to work? Maybe. On Wednesday, Georgia lawmakers in the House of Representatives and Senate approved their chambers’ versions of legislation that would create a new regional agency that could kickstart a long-awaited expansion of bus and rail lines throughout metro Atlanta. If successful, the effort could end decades of bickering and delays over building a new mode of transportation that could shift the way the auto-centric region develops, and how people move to jobs and about their lives. Like all big initiatives, it’s complicated, and details are subject to change. Here’s a rundown of where things stand. For more than five years, state lawmakers have debated, studied, and procrastinated on two big transit issues. First, whether they should create a regional agency that would oversee buses and rail lines in metro Atlanta. And if so, whether the state would help fund those transit routes. Aside from operating the Georgia Regional Transportation Authority’s Xpress commuter buses and some grants for capital projects, the state does not cough up cash to operate MARTA buses and rail, making it one of the country’s largest transit systems to operate without state support. Sponsored by state Sen. Brandon Beach, a Republican from North Fulton, the bill would create a regional body called the Atlanta-region Transit Link Commission, or ATL, to oversee the planning, funding, and operations of bus and rail in 13 metro Atlanta counties—Cherokee, Clayton, Coweta, Cobb, DeKalb, Douglas, Fayette, Forsyth, Fulton, Gwinnett, Henry, Paulding, and Rockdale. The ATL would create a regional transit plan. Districts could opt in and ask voters to approve a 30-year sales tax in their county to build the bus or rail systems. 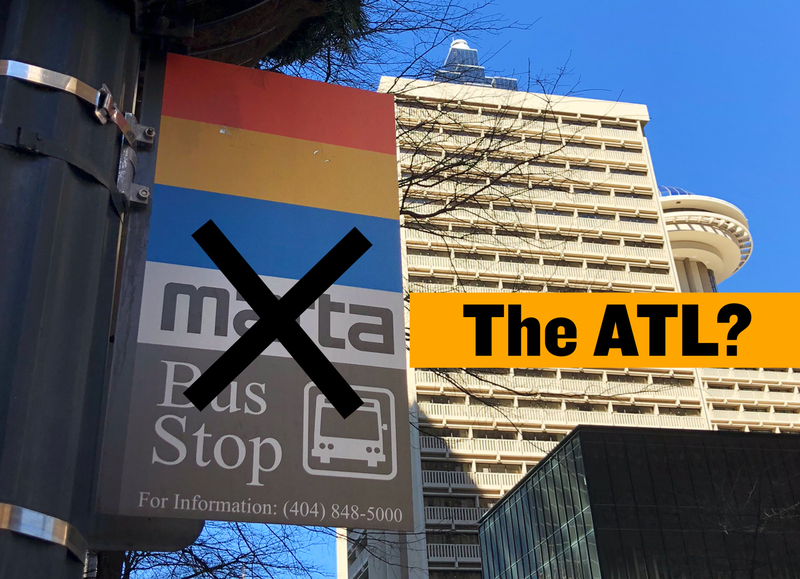 The new lines, including MARTA, would brand themselves by 2023 as the “The ATL.” MARTA, and MARTA alone, would operate existing and new heavy rail lines, although those vehicles would carry “ATL” branding. Wait, what? No more MARTA logo? So how does MARTA feel about this? It’s worth noting that there’s a flipside to Beach’s argument about the negative perception of MARTA. In some parts of the region, namely Fulton and DeKalb, where residents have been bankrolling the transit system for 40 years and have relied on it to get to more places than just the airport and Atlanta Falcons games, there might not be such a negative connotation. In fact, it’s even positive. That debate isn’t worth derailing the effort unfolding under the Gold Dome, but discussions about rebranding—and where and why—should be done carefully. What happens to MARTA? Or Gwinnett County Transit? Or Cobb Linc? The agencies will continue to operate. In fact, MARTA could ostensibly already serve as the regional transit agency and counties could join it. But these efforts are intended to nudge the larger metropolitan area to work together to create a “seamless” transit network. And what about the House Bill? The piece of legislation by state Rep. Kevin Tanner, a Republican from Dawsonville, would essentially do the same thing as the Senate version, only this proposal covers 10 districts spread across those same 13 counties and includes potential state funding for the transit lines. Funding could be generated by a sales tax levied in airports, a 50-cent surcharge on Uber, Lyft, and taxi rides, and a local referendum. Cash collected in the district would not go into a huge pot and hoovered up by others; it would go toward that general area’s transit projects. The House and Senate both overwhelmingly passed their respective versions of the bills on Wednesday, or Crossover Day, the day legislation must pass either chamber or risk “dying” for the session. They now move to the other chamber to be picked apart, held hostage, or pushed toward final adoption. Which one will the Legislature end up adopting? It’s hard to say. That’s partly why the Gold Dome is such a fascinating place. Although Beach has spent the most time on his proposal, even once embarking on a three-hour plus bus ride from Kennesaw to Duluth to show how convoluted our transit network is, more momentum seems to be behind Tanner’s legislation, which earned praise from his Republican and Democratic colleagues in the House. Elements of one bill could find its way into another, effectively merging or marrying the two before the Legislature gavels to a close on March 29, the final day of the session known as Sine Die. Will lawmakers really pass this legislation? We’ve been here before. So many times! We might regret saying this, but . . . this time feels different. The announcement by Amazon that it wanted its second North American headquarters to be located near transit, plus other recent corporate relocations next to MARTA lines, has finally shown suburban leaders that they have relatively few amenities to offer 21st-century corporations and their workers. The suburbs are alive and well, but no one wants to wallow in their gridlock. Though some lawmakers are dragging their feet, warning that autonomous vehicles could be available in less than a year, the General Assembly seems serious about finally doing something about our lackluster transit network. If Governor Nathan Deal signs the bill into law, will we see action immediately take place? No. What is happening at the Georgia Capitol is a huge step toward creating the transit network metro Atlanta has long needed but counties have avoided. But it’s just one step. Counties have to actually want transit and and opt in, much like they must do with MARTA, and begin the process. They’re not obligated to do anything. If they do, expect county-level fights over funding and planning. Or we can just keep sitting in traffic.